Guthrie traveled the country by freight train during the Great Depression, composing and singing folksongs that gave lyric voice to the lives of the economically downtrodden and dispossessed and that also expressed the somewhat sentimentalized ideals of American labor and populism. Best known among his more than 1,000 songs was “This Land Is Your Land,” which became an anthem of the Civil Rights movement during the 1960s. 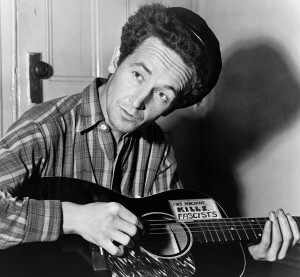 Guthrie was a major influence on the folk music revival of the 1960s, on Bob Dylan in particular, and on American popular music generally.